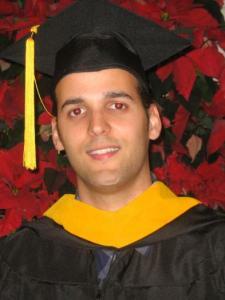 I graduated from Barry University with a Bachelors in Mathematics. The mathematics department at Barry University is very knowledgeable; all of my professors had PH.D. degrees. They also come from different regions of the world in which they bring extra wisdom to the department. (Cuba, India, Bulgaria, Russia, Mexico, Colombia, and Argentina). Why hire me? What differentiates me with other tutors? I have a Bachelors in Mathematics. I believe that tutors should have a strong Math background to teach Math, otherwise they should not be teaching Math to students. I am also a certified teacher with over 8 years of experience. My students and their parents love me and appreciate what I do. Parents and students can sense that I really care and want them to excel in their studies. This is why I spend at least an hour preparing a session. All of my sessions are prepared in order to get the most out of the lesson, and to focus on the areas that need improvement. The easiest way to solve a problem is the most effective way! This is what students want and need. I always teach them the easiest way to tackle a problem. I will work hard with the student by giving them plenty of work. I believe that sitting down, opening a book and practicing is the key to success. Practicing is very important. I am fluent in English and Spanish. I can teach your son/daughter Mathematics, Physics, FCAT, SAT & ACT Preparation overall knowledge. My teaching skills can improve your scores since I my teaching techniques are effective. I also use one of the best SAT books available; Gruber is recommended by top professors in the nation. Subjects that I have taught my previous students are: Mathematics (SAT & ACT preparation, Pre-Algebra, Algebra 1 & 2, Geometry, Trigonometry, Statistics, Calculus (1,2,3), Differential Equations, Linear Algebra, and Computer Programming). I have many books regarding these subjects, therefore, I can give the student plenty of work. I know the methodology to teach in order for students to be successful since I've walked in their shoes! Important Note: I request parent supervision at ALL times during my tutoring sessions. At least one parent MUST be at home when I'm working with the student. Statistics is a beautiful subject. It is the practice of collecting and analyzing numerical data. I have taught Statistics and Bio-statistics for over 7 years. I would explain the material in a very easy way by providing the student with real life examples. It is extremely important to teach effectively in this class. Topics: Probability of compound events, z-score, confidence intervals, ANOVA, t-statistic test, and hypothesis testing. I have taught elementary math for six years. It is crucial to have good addition, subtraction, multiplication, and division skills. Arithmetic skills is the most important aspect of Algebra 1. Solving polynomials, matrices, linear functions, and geometric relationships are involved in Algebra 1. Having these type of skills lead one to solve any equation or problem. Having the right arithmetic skills is the key for success in any mathematics class. This course is designed to build on algebraic and geometric concepts. It develops advanced algebra skills such as systems of equations, advanced polynomials, imaginary and complex numbers, quadratics, and concepts and includes the study of trigonometric functions. It also introduces matrices and their properties. The content of this course are important for students’ success on both the ACT and college mathematics entrance exams. Calculus I is an introduction to differential and integral calculus: the study of change. Calculus I is a beautiful subject that is interconnected with physics by nature. We will work with functions represented in a variety of ways: graphical, numerical, analytical, or verbal. We should understand the connections among these representations. Also understand the meaning of the derivative in terms of a rate of change and local linear approximation and they should be able to use derivatives to solve a variety of problems. This course is designed to emphasize the study of the properties and applications of common geometric figures in two and three dimensions. It includes the study of transformations and right triangle trigonometry. Inductive and deductive thinking skills are used in problem solving situations, and applications to the real world are stressed. It also emphasizes writing proofs to solve (prove) properties of geometric figures. Pre-algebra is an introduction to algebra. Students will work on arithmetic skills, equations, linear functions, probability, and area problems. It is crucial to have good arithmetic skills. In order to get higher scores on the SAT Test, the first step is to get the best SAT book ever (Gruber's Complete SAT). Next is to have a good tutor that knows exactly the strategy in order to solve problems. Technique is key since having this leads one to solving any problem. Gruber's is recommended by the top professors in the nation. I've been teaching ACT Math for many years. My students have excelled on this test. It is crucial to learn the strategies before taking the test. I will always teach you in a very simple way. All of my sessions are planned in order to get the most out of it. Biostatistics is a branch of statistics that is interconnected with biology, science, and health. I have taught Biostatistics for over six years. The student will learn and not memorize! Most of my students are in a Masters' program. I've helped them with research projects (Making all types of graphs from a data base and analyzing them), data analysis, graph interpretations, and preparing for upcoming tests. My teaching method is to clarify the material being taught by putting it in my own words and by proving concrete and real life examples. The interpretation is crucial. Important topics: Confidence Intervals (Extremely important), Margin of error, z-score, alternative and null hypothesis, areas under the curve, types of probabilities, and hypothesis testing. Erick is very organized and prepares lessons to fit student needs. He really cares about his students and works with them to set up good study and practice habits. I found his tutoring very satisfactory.